ComingSoon.net & SuperHeroHype attended Hasbro’s 2017 Entertainment Brand Preview at the New York Toy Fair this weekend, and we came away with a gallery of over 85 images of products from the Marvel, Star Wars and Transformers toy lines. Check out the Hasbro Toy Fair gallery via the link below! 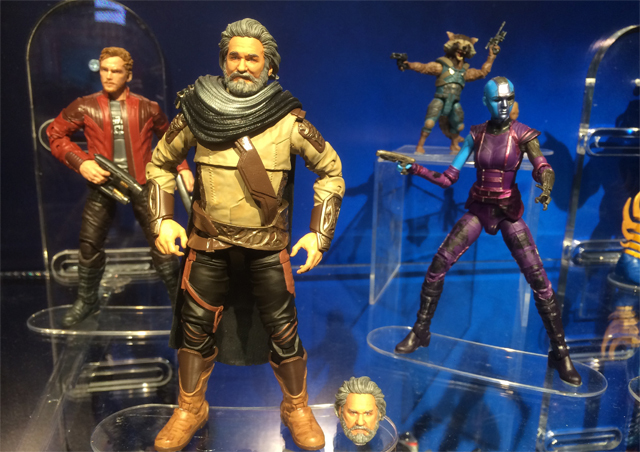 In the galley, you’ll find amazing toys from Marvel Studios‘ big 2017 releases Guardians of the Galaxy Vol. 2 and Spider-Man: Homecoming, including your first good look at Kurt Russell’s Ego The Living Planet and Michael Keaton’s Vulture. While Thor: Ragnarok was teased during the presentation, no images or toys were forthcoming. Guardians 2 opens on May 5, Homecoming on July 7 and Ragnarok on November 3. On the Star Wars front, you’ll find lots of new Black Series figures and much more, though nothing from Star Wars: The Last Jedi beyond the initial packaging. The Last Jedi doesn’t open until December 15, 2017, so don’t expect too many toy previews until we get closer to Force Friday II on September 1. Finally there’s an abundance of toys from Michael Bay’s Transformers: The Last Knight, including an actual movie prop of “Sqweeks,” the cute Vespa Transformer from the June 23 release. Which Hasbro toys are you most excited about? Let us know in the comments below!